Politicians across the spectrum believe the best way to deliver public services is to hand them to the private sector. Are they right? 1. The biggest privatisation drive in the NHS's history. The Government has sought to increase the privatisation of the NHS with the Section 75 amendments to the Health and Social Care Act. Under the changes, GPs will be forced to open up all contracts to "any qualified provider", including profit-making health firms. It'll increase the pace of something that was happening anyway: the slice of the NHS's budget going to non-NHS providers has risen from £5.6bn in 2006-07 to an estimated £8.7bn by 2011-12, according to a recent analysis by the Institute of Fiscal Studies and the Nuffield Trust think tank. Worry number one: politicians are supposed to measure how these companies are doing, but it's easier to cheat the system when there's a new interface. Actually, it's not even a worry: it's already happened. The outsourcing firm Serco has already been caught out once this year after the National Audit Office found it fiddled its data when reporting to the NHS on targets it failed to meet. Worry number two: there are mechanisms - like the Freedom of Information Act - that allow public sector services to be held to account in a way private sector companies aren't. When campaigners in Suffolk found out Serco was planning to cut jobs, they only did so because of an anonymous letter. And as for finding out what Serco offered that other bidders for their contract didn't, good luck with that. Might it have had anything to do with the aforementioned job losses? Worry number three: integrated care. Buzzwords du jour. Every politician since the year dot has gone on and on about how important integration is. Your bad back means you're sitting on the sofa watching footy rather than playing it. And you're sad that it's made you fat, so you've turned to drink. And you always smoke when you're drunk. You're a sad, flabby, drunk mess with smokers' cough, and our leaders agree all your issues need to be treated at once. Fine: but now we're hearing about how useful an "increasing multitude of providers" is. Campaigners worry that we're inadvertently fragmenting the health service. 2. We might be about to outsource the job of thinking about outsourcing. It takes a certain conviction in the idea of privatisation to come up with this idea, but Cabinet Office minister Francis Maude has suggested that Government policy-making should be outsourced to - among other bodies - think tanks, which have tax-free charitable status based on their aims to improve public policy. At which point you have to consider how think tanks are funded and why there could be a transparency issue here. Many of them won't tell you where they get their money, as this site shows. But let's take an example of one whose funding we do know about. Reform was founded by Nick Herbert, one of those Tories it's generally considered ok for lefties to like. Last year it received £1,251,501. It recently produced a report entitled The Case for Private Prisons, which suggested private prisons offer better value for money and lower reoffending rates, an argument which wasn't supported by the Prison Reform Trust and was even described as "simplistic" by prisons minister Jeremy Wright. It's possibly worth noting at this point that three of its "corporate partners" are G4S, Serco and Sodexo, who run all the private prisons in Britain. Of course, there's a counter-argument that all they're doing is throwing ideas into the ether - but you can see why you'd worry about ideas coming from bodies whose funding plans we're not allowed to see. 3. We plan to run classrooms for profit. Michael Gove is drawing up plans that will see academies and free schools becoming profit-making businesses using hedge funds and venture capitalists to raise money. Department for Education insiders leaked the details to the Independent a couple of months ago. They're worried about many aspects of the plans - not least the secrecy surrounding them - and once you think about the economy of a school you can see why. This author got an A in his English GCSE with just a NEAB anthology and one tattered copy of the Bloodaxe Book of Women's Poets to help him. But it took him an entire chemistry lab and two potentially lethal accidents involving a flaming strip of magnesium before he scraped through double science. Different subjects cost different amounts to teach, and campaigners are concerned we're going to start limiting the availability of the expensive ones. Things got weird earlier this year, when a subsidiary of the haulage firm Eddie Stobart emerged as a leading contender in bidding for a new generation of criminal legal aid contracts that would deprive defendants of the right to choose their own solicitor. "How is anyone facing serious criminal allegations going to feel being represented by a haulage company?" he asked. "The individual will have no choice. The state will prosecute you and then choose your lawyer. By removing choice, providers will have less incentive to compete on quality. We will end up with far more miscarriages of justice." 5. We're outsourcing the justice system (pt 2): not just the prisons, but the prisoners. Burglars and other criminals are asking unsuspecting families if they would like to save money on their home insurance. The inmates get paid to read from a script which includes asking potential customers their names and postcodes. They also inquire about the total value of their possessions – including details of any worth large sums. Now you might think that this is a recipe for disaster. But the company will tell you that the security protocols are tight and despite the low wages it's better to prepare prisoners for life on release and so help to keep them from reoffending. You might not agree, but that's not the point. You elected the Government who commissioned the private company, so shut up. You don't get to ask questions. Bit of a shame though, because one you might like to ask is - who's making money from this? G4S aren't employing prisoners at £5 a day in order to boost their own profits - the inmates are working for nameless "insurance companies". Shouldn't you, the taxpayer, be able to find out which companies are making use of this scheme? Well you can't, because that would break commercial confidentiality laws. Anyway, you can't be arrested by a private policeman yet (though some analysts think it might only be a matter of time - private companies are working in the backrooms of some police stations), but having been defended by a private lawyer and kept in a private prison, you might think that was the end of your engagement with the private sector. Well, you'd be wrong. 6. 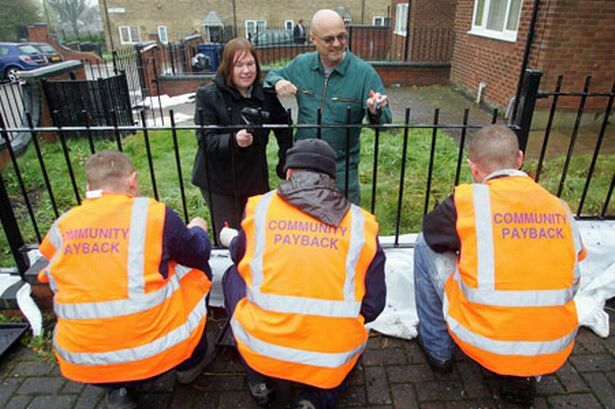 We're outsourcing the justice system (pt 3) - the probation service. The probation service, which currently deals with 250,000 cases a year, will remain responsible for the 30,000 high risk cases, while control of the roughly 220,000 low to medium risk offenders will go to private firms and voluntary groups. Which gives rise to an obvious question: how do you tell if someone is high, low, or medium risk? Are people really that simple? Aren't these definitions changing all the time? A series of "triggers" are proposed. If the offender is of a certain risk level to go to contracted services there are triggers that mean they come back. It might sound a decent solution - but there's remarkably little detail on what these triggers are. And there's another problem: that of accountability. Bluntly: if the public sector is overseeing things, then whose fault is it if an offender being dealt with by the private sector kills someone? The idea is that the provider will be accountable if they haven't pulled the "triggers". But the thing is, we've introduced money into the equation. Surely it could mean the providers will be incentivised to pull some triggers and leave others? It's a good job there hasn't been a series of high-profile incidents involving outsourcing companies attempting to pull the wool over the Ministry of Justice's eyes. With the slight exception of this one. Oh, and this one. 7. We're outsourcing more social care: the one thing social care workers think we shouldn't do. A recent survey of workers by Community Care has found the transfer of social care services from councils to private providers has been bad for the sector. Two-thirds said the quality of adult care had deteriorated because of large-scale outsourcing since the early 1990s, while 90% thought that outsourcing had been driven by the will of councils and governments to cut costs. Only one in four unqualified care workers is a trade union member, leading to concerns over the lack of protection for staff outsourced to the private sector. So our policy makers have listened to their concerns and...attempted to roll out GP-style social work practices under the Big Society banner. And they've come under fire after four authorities pulled out of a pilot scheme, citing a lack of funding. Warwickshire, Coventry, South Tyneside and Lincolnshire councils withdrew from a second wave of children's social work practice pilots to be launched this year.